Some nights when my boys are all snuggled in their beds, or mine, I kind of miss them, a lot. They’ve been sleeping for a few hours, so I’ve simmered down. The morning seems like a long ways away. The house is too quiet. I don’t miss them quite enough to do something crazy, like wake them up. At midnight. However, confessional time. I used to do this awful trick that I now realize was good intentioned-ish, but wrong. So wrong. I used to get bored babysitting when the kids went to sleep. Often, I would go in to “repeatedly check on” sleeping or napping kids, running into things on purpose, trying to wake them up. I mean, was it so awful that I possessed a strong desire to put in the hard work, earn my money? Actually babysit some kids. I’m not going to lie, it was always awkward trying to get comfortable on someone else’s couch, creep in their cubbard for snacks and figure out how to work their TV. Reading a book was too quiet of an activity. I didn’t want to hear all the weird sounds of somebody else’s house or cozy up to that psycho cat. I know. I know. Not all cats are sneaky and creepy. Wink. Wink. So, tonight I pretended I owned a Margarita Restaurant. I was thirsty. And bored. And not tired yet. My restaurant specialized in “dirty” margaritas. It’s the best margarita you’ll ever have. I’m not humble. It is the absolute best. We can or actually just I can, until I hire some help, make strawberry, mango or plain lime. The secret ingredient, which may gross some out, is throwing a little olive juice in there(that is why I would never tell my imaginary customers). That’s right. On the rocks or frozen. Deliciouso. We will even bust out the home grown limes, if you’re a favorite patron. Those limes mean business. Chocolate wafer cookies or leftover homemade pretzels can be added to your margarita order. In a perfect world, I would wear whatever comfy clothes I wanted and invite all my friends to come over, while the kids were sleeping. My friends and their friends would be able to keep the fun at a reasonable noise level, as to not wake up the party poopers, those sweet sleeping children. Maybe the payment for your awesome margarita would just be helping fold clothes. Nothing creepy like underwear. But not the towels, those are too easy and my favorite for that reason. On a nice night, you could enjoy your margarita on the deck. I probably need to add some lights out there, maybe a bug repelling candle. I should have some chips and salsa on hand too. I don’t want to be known for anything except the wicked awesome margaritas though. I will only use real fruit, you know, to make them healthier. 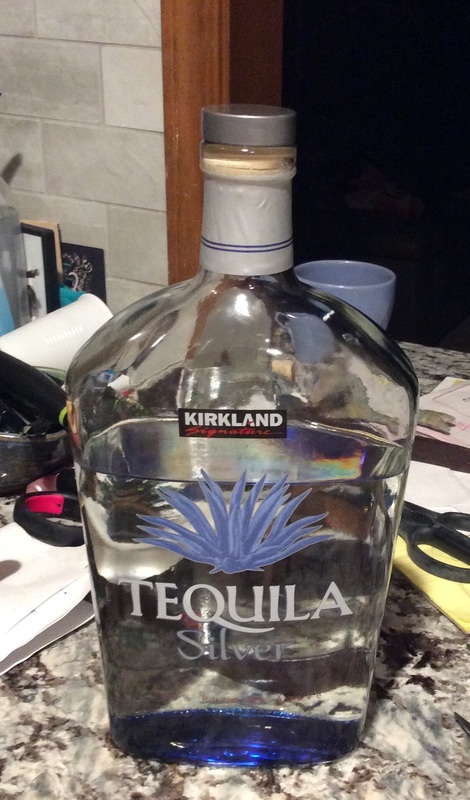 They can be virgin too if you’re queary of Kirkland tequila or don’t drink alcohol. If my imaginary margarita restaurant is a success, which of course it will be because it’s all in my hyped-up imagination, then I may consider opening up a taco joint too. My husband makes the most phenomenal smoked carnitas and pineapple salsa. It would be safe to say that had I known about his smoking pork skills, I would have married him just for that. Those of you who have tried it know that it will turn a vegan into a pig-raising fool. Since he recently half-admitted to marrying me for my mad spelling skills, we’re even. True love is hard to find. Speaking of true love, I think my single friends could find this too at my margarita restaurant. If they wanted to, no pressure. I secretly want to be a matchmaker too. This imaginary margarita restaurant will be amazing. I do hope you’ll come sometime. Next > Shame. Shame. I know your name. One virgin mango margarita and pineapple salsa for me please .